Cinnamon Walnut Coffee Cake, the perfect fall Comfort Cake. Full of the taste of Cinnamon and Walnuts. Eat it for Breakfast, Snack or even Dessert. This is a Cake everyone will love. As I write this there is only five more days till Christmas. And I still have so much to do. I still have to wrap, get my cookie plates together to give to friends and family members and who knows how many other things I have to do and you too I imagine! With the mild weather here in Italy I find it really hard sometimes to even believe it is Christmas. If I could only have one day of snow it would be on Christmas. As a child Christmas is presents, Santa, hoping it is going to snow and a really cute outfit to wear. Now as an adult it’s the buying of the presents and of course feeding the hungry guests (they always seem hungrier on Christmas). I remember my family Christmases in Canada as being a continual eat-a-thon. There was food everywhere, we started in the morning and didn’t stop till midnight, ok maybe a slight exaggeration but you get my drift. One of my favourite parts was brunch. Do you still do brunch? It is actually becoming quite the thing here in Italy. We would eat bacon, eggs and a couple of quick breads and a wonderful delicious coffee cake. And this my friends is one of the best ones I have ever made or eaten. 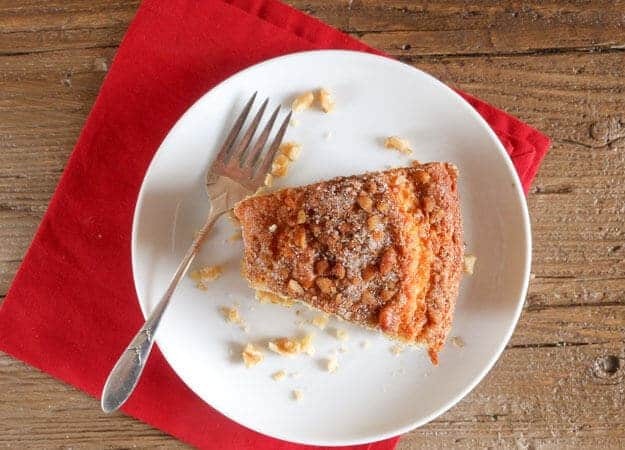 I love the combination of nuts and cinnamon and it really is moist and don’t you just love when a cake rises so high that you need to take two bites from one fork full of cake. Don’t forget the yummy centre filling and streusel topping. Oh how I love cinnamon, as far as I am concerned nothing beats cinnamon, ok maybe Chocolate. 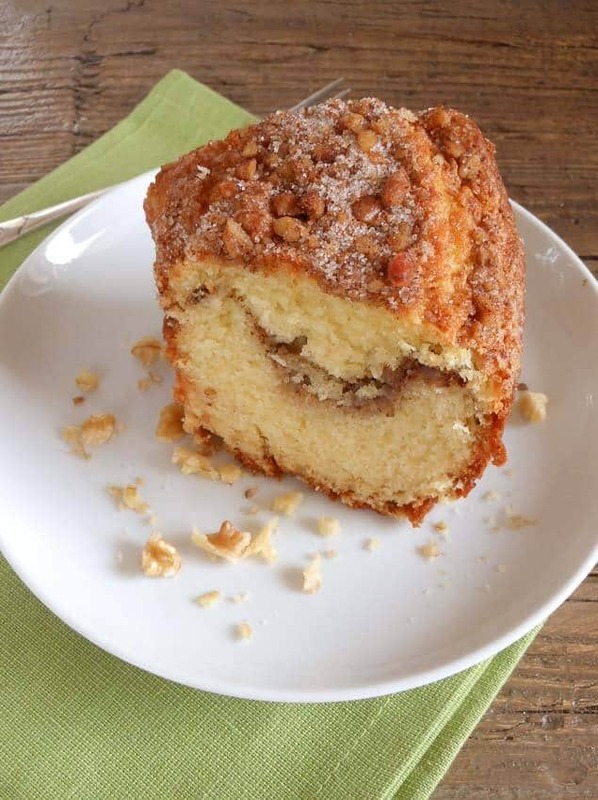 So if you are looking for a tasty Coffee Cake to make you won’t be disappointed with this Cinnamon Walnut Coffee Cake. Enjoy! The delicious combination of walnuts and cinnamon make this the perfect coffee cake. Pre-heat oven to 350° (180° celsius), grease a 10" (4 liter) tube pan. In a small bowl combine topping ingredients and set aside. In a medium bowl with a whisk combine flour, baking powder, baking soda and salt. In a large bowl cream butter and sugar at medium speed until fluffy, add eggs, one at a time, beating until light and creamy. Add dry ingredients alternately with the greek yogurt and vanilla to the creamed mixture, mix with a wooden spoon until smooth. Spread half the batter in the prepared tube pan, spoon 3/4 of the topping over batter. Cover with remaining batter and top with remaining topping. Bake for approximately 60-65 minutes or until inserted toothpick comes out clean. After 50 minutes if it is not done but is becoming too brown cover with foil until baked. Cool. Enjoy! Re published from December 2014. My yogurt went bad in the fridge, I have everything ready to go except the yogurt, I read other posts about using sour cream instead, I realized I have light sour cream in the fridge, could I use that? Organic coconut milk kefir, it’s like yogurt, there is no sugar added and it says in the back of the jar..use in place of yogurt, sour cream or whipping cream. Any thoughts or should I go and get some yogurt from the store? Hi L, I would try the organic coconut milk kefir, since it most resembles yogurt and it’s a one for one substitution, no need to go to the store. Let me know how it goes. Great recipe! My husband and I loved it but I have a question. The middle layer of cinnamon, sugar, and walnuts sank to bottom while baking. Do you know why this would happen? Hi Annie, maybe add a teaspoon or two of flour and see if that helps. Thanks, glad you like the cake. Is Greek yogurt and plain yogurt interchangeable in this recior? I realize Greek yogurt is much thicker. Can the same amount be used if using regular yogurt instead ? Thank you! Hi Stephanie I think you could substitute regular for greek, what you should do is strain it first to remove the extra liquid. Overnight works best so 8-10 hours. Although you may try (I haven’t made it this way though) is add 1 – 1 1/4 cups of regular yogurt instead of greek. Start with 1 cup and add the extra if you need to, check the video, because the batter is very thick. Hope this helps. I made this by the weight and it was excellent. My only changes where 2 reduce vanilla to one teaspoon and I added 1/4 teaspoon of black walnut extract. I didn’t have any Greek yogurt so I used half the weight in sour cream and the rest in plain kefir milk. Mine also cooked in 50 minutes So I was glad that you had suggested we check at this point. Thanks for this. Hi Kitty, thanks so much and so glad you enjoyed it. The black walnut extract sounds amazing. Have a great weekend. Hi Debby to tell the truth, I always let a cake cool completely before removing it from the pan. As long as you greased and floured the pan it will come out fine. Just run your knife along the edge to loosen it. Hope this helps. Hi, what is Greek yogurt 365 please? Hi Diane, it should read 365 grams, corrected thanks. Hi Sarah, yes you can use vegetable oil instead of butter. Use 2/3 cup vegetable oil for the 3/4 cup butter. Hope that helps. Hi Rosemary, I was wondering if pecans could be used instead of walnuts. Hi Kris, sure pecans would be delicious. Hope you enjoy it. 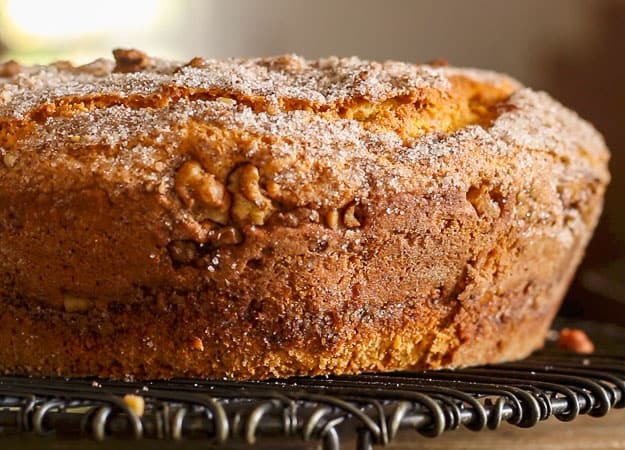 I decided to look up a cake recipe according to the ingredients I have (walnuts, cinnamon) and this was the first to pop up and oh I’m glad it did !!! It’s so easy to follow and it was absolutely Delicious, everyone loved it was gone before it cooled down ! Will be my go to revoke for a fall/ winter or maybe all year long cake! Hi Serin, thanks so much, so glad you and everyone enjoyed. I actually make this cake year round. Have a great week. Rosemary, I’m another Rosemary and let me compliment you on this beautiful cake. It took 50 minutes in a fan-forced oven at 170 C, for anybody who is interested. We ate it with double cream. Well done, literally. Thanks, Rose. Hi Rosemary, thanks so much and thanks for letting me know the baking time. And so glad you all enjoyed it. Have a great weekend. Can sour cream be used instead of yogurt? Hi Emilu yes you can substitute sour cream for yogurt. Hope you enjoy it. Hi Rosemary, I make so many of your cakes because they are outrageously DELICIOUS!!! My husband and sons love any cake with cinnamon. I always question myself if I should use salted or unsalted butter and which oil is best for baking when it is not specified? Thank you for all of the wonderful recipes – I am your biggest fan ?. Hi Linda, thanks so much. I always use salted because I can’t get unsalted in Italy and vegetable oil is usually corn or sunflower. I will note that in the recipes. Sorry about that. And thank you for loving the recipes. Happy New Year. Hi, I’m new at baking and your post caught my eye and tastebuds. Really want to try the cinnamon walnut cake. Do you think I can use vanilla Greek yogurt? Hi Rita, sure that would work. Let me know how it goes. I made this for the first time today to sell slices with tea or coffee. It came out perfectly! It looked beautiful and was delicious. I had many positive compliments. I´ll definitely make it again. Thank you–it was just what I was looking for. Hi Zouhair, thanks but I have never made this cake with anything but butter and apparently it isn’t a good idea when you have to cream the butter. Regards. Do you think it would be ok to bake this batter in a bundt cake pan or a 9×5 loaf pan? I don’t have a tube pan and I really want to make this. Your recipes are always soooo yummy. Hi Adriana, thanks so much glad you like them, and sure no problem either pan will do, just make sure you don’t fill the pan more than 2/3 full. Hope that helps have a great weekend. Had an almost empty larder but had walnuts and was able to make this with 2/3 white flour and 1/3 whole wheat. Didn’t have enough butter so reduced to 1//2 cup. Had to use white and brown sugar. I also used a loaf pan instead of a tube pan and reduced temperature. Came out great! 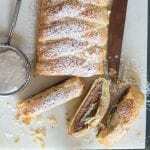 I’m always happy to find inspiration on the web and this recipe didn’t disappoint. Hi Susan, thanks so much glad you enjoyed, I think I need to make it again soon. Have a great weekend. Hi. Lobe this recipe and want to try it today.can i substitute the butter with veg.oil? If so how much? Or can i use 50% butter and 50% oil? Hi Nurcan, so glad you enjoyed it and everyone else. Have a wonderful Christmas. Oh my gosh I am so sorry Jenn, Yes a miss calculation on my part. I doubled it. Sorry about that. Hi Alison, Coffee Cake is just a name given to a type of American Cake, in this case a cake that is usually eaten with coffee. Hope that helps. Thanks. Hi Joeann, Im sure it will be fine, but good luck anyway and let me know. Happy Sunday! Looks like a marvelous recipe. I am going to try it, but I don’t have a tube pan. 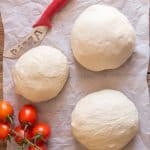 Will a regular round cake plan work as well? Would I need to make any baking adjustments for the type of pan I have? Thank you in advance! Hi Vanessa, a regular cake pan will work just fine probably best a 9 or 10 inch pan. Have a great weekend. I made this coffee cake this past weekend and it was absolutely delicious! What a great recipe! Thank you! Hi Marisa, Hope you are enjoying your family get together. I’m sure my daughter would love that green tea that you were drinking. And yes I love eggs too. Have a wonderful Sunday.